Eat|See|Hear will celebrate Christmas in July on Saturday, July 12 with a showing of the 1989 comedy "National Lampoon’s Christmas Vacation" starring Chevy Chase. The 2nd annual event will include an appearance by Santa Claus, holiday decorations, a raffle with great prizes and a donation drive benefiting Best Friends Animal Society-Los Angeles. We're excited to celebrate Christmas in July on Saturday, July 12! Santa will be with us and we'll have plenty of fun holiday-themed activities. 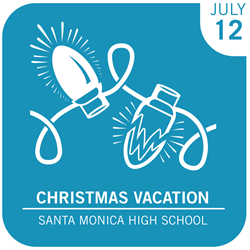 Eat|See|Hear shows outdoor movies throughout LA and will be celebrating Christmas in July on Saturday, July 12, 2014 beginning at 5:30 p.m. at the Memorial Greek Amphitheater at Santa Monica High School, located at 601 Pico Boulevard. The evening will culminate with the showing of the 1989 comedy “National Lampoon’s Christmas Vacation” starring Chevy Chase and Beverly D’Angelo at 8:30 p.m. There will be a live performance by Charles McDonald at 7:00 p.m. The event will include an appearance by Santa Claus, a Christmas tree and holiday decorations, a raffle with prizes and a donation drive benefiting Best Friends Animal Society-Los Angeles. Food trucks including Bool BBQ, Baby’s Badass Burgers, Rice Balls Of Fire, India Jones, No Jodas Kitchen, Flat Iron, My Delight Cupcakery, Coolhaus, Brasil Kiss and others will also be at Santa Monica High School during the event. The Memorial Greek Amphitheater offers limited seating and previous Eat|See|Hear events held at this venue have sold out. Purchasing tickets in advanced is recommended. Tickets are $10 in advance for adults and $8 for children under 12 with kids under 5 getting in for free. Tickets may be purchased online through EventBrite. Paid parking is available in the Civic Center parking structure located at 333 Civic Center Dr. and sometimes next door at the DoubleTree Hotel. Limited street parking is available, but Eat|See|Hear cautions attendants to pay attention to posted signs to avoid being ticketed or towed. There is also ample bike parking available. Eat|See|Hear is LA’s premier outdoor movie, food truck and live music event series that brings an evening of fun to Los Angeles-area communities each summer. The third annual series is presented by SHOWTIME, featuring up-and-coming bands from the local music scene, the hottest food trucks, and the only 3-story high, 52-foot wide inflatable movie screen west of the Mississippi with the highest quality HD-projection and digital surround sound. Eat|See|Hear is produced by LA-based Trailhead Marketing, Inc. with audio-visual provided by Hollywood Outdoor Movies. For more information about the third annual Eat|See|Hear summer event series, consumers are encouraged to visit the Eat|See|Hear website at http://www.eatseehear.com, as well as the Eat|See|Hear Facebook page, Twitter feed (@EatSeeHear) and Instagram (@EatSeeHear) for the latest updates.